As the clock counts down to the end of what's been an exciting and crazy year, I'll be with JoanMarie in Yosemite National Park. We wanted to attend their New Year's Eve celebration last year, but tickets sold out extremely fast. So this year, the very day they went on sale in March, I woke up early and got 'em! I'll see you in 2010 with more posts about whatever I feel like postin' at the time, more contests (including a giveaway of two very special books during the first week of the new year), and hopefully something really exciting will happen so I can uncross my fingers and tell you all about it! Thank you all for making 2009 a year which I'll never forget. A few weeks after JoanMarie and I married, we moved to Wyoming for six months so she could complete a college internship. 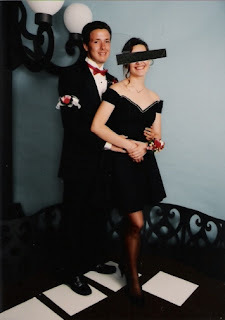 Although I didn't know it at the time, if not for that move, I probably never would have written Thirteen Reasons Why. While there, I worked part-time as a bookseller at an indie bookstore and part-time as an assistant children's librarian. Because of that library job, I first began reading teen novels. It was on my way to that job that I first came up with the idea for my own teen novel. Of course, it was also at that job that I led my very first children's storytime...and only one child showed up. Reading a story to one child is fine, but leading one child in movement-oriented songs is extremely embarrassing, especially when the mom is watching and you know she can tell you have no idea what you're doing. 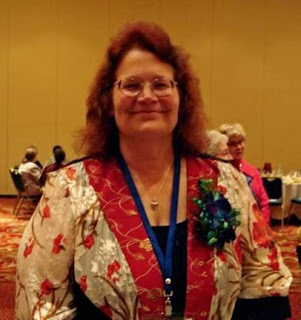 I just found out that Michelle Havenga, the head children's librarian (and my boss), recently won the Wyoming Library Association's 2009 Distinguished Service Award! JoanMarie’s stepfather, my stepfather-in-law, passed away early this week. We’re in Mount Shasta right now, along with JoanMarie’s youngest sister, staying with their mother. The other two sisters were in town a couple of days ago. Bill was born in 1922. He served in the U.S. Combat Infantry 103rd Division in World War II and was a prisoner of war survivor. He worked as a drafter and a church pastor, which is where he met DonnaJo, the church organist (JoanMarie’s mom). I always loved that the church pastor married the organist! I will always remember Bill as a great storyteller and, over the past several days, have enjoyed recalling many of my conversations with him. The Nineteenth Amendment to the U.S. Constitution passed, giving women the right to vote. King Tutankhamen’s tomb was discovered. A man in Minnesota became the first person to ski on water. Nosferatu the Vampire was released. Original shots, borrowed clips, great music...and anime! Psst! Hey, Hollywood. Are ya payin' attention? For my final book-related outing of the year, Cleveland was a great note to end on. Sure, it was bone-chilling outside. Sure, I should've listened to JoanMarie and packed warmer clothes. But it was still a wonderful visit! The first school I spoke at was Brush High School. Two other schools sent students to hear my presentation, and another six watched live through a distance learning program. So how many total students was I speaking to? I have no idea! A lot of people ask if I ever get writer's cramp from signing books. Well, I don't believe in writer's cramp! Signing books is just way too much fun to let hand muscles get in the way. It's mind over matter, baby. Finally, to end my first trip to Ohio, I had a booksigning at the bookstore. I also got to see the house from A Christmas Story!!! And yes, they had a leg lamp in the window. Thank you, Sharon, for getting me to all of my events on time...and indulging my cheesy tourist requests. This will be my first trip to Ohio, and also my final book event of the year. After speaking at two high schools during the day, I'll sign books at Joseph-Beth Booksellers at 7pm. If you're around, please stop by! But first, if there's time after my flight arrives on Thursday, I'm hoping to swing by the A Christmas Story house. I actually saw A Christmas Story this Tuesday night at the Fremont theater. (You may know that theater as the inspiration for the Crestmont theater in my book.) The older I get, I swear, the funnier that movie gets! I'm reading a non-fiction book right now by Hank Stuever called Tinsel: A Search for America's Christmas Present. One of the families Mr. Stuever follows for three Christmases in Frisco, Texas is the Trykoski family. Every holiday season, they set up an insane light display on their house and in their yard. When people drive by, they tune their radios to a certain station, and the lights put on a show to the music. JoanMarie was raised on classical music. I was raised on classic rock. So she was excited to hear about a fundraising holiday concert which would include selections from Handel's Messiah (especially since that was something she performed in college). 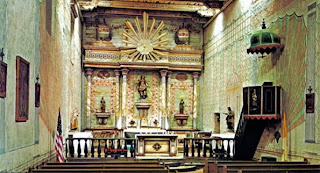 The performance was set to take place in the partially restored Mission San Miguel. Below is a photo "borrowed" from the Mission's website, and by the time we got to the place, almost all of the pews were filled. The musicians and choir were at the front of the church and it looked like it would be a beautiful performance. I was actually shocked to see so many people almost busting down the adobe walls of this minus-2000 population town. The staff was very kind, setting up folding chairs to accommodate as many people as possible. Unfortunately, seven of us wouldn't fit. But they took pity on us and said that if we wanted to sit in a room off to the side, we would still hear the musicians, we just wouldn't be able to see them. A good attitude can make almost anything entertaining. But listening to a bunch of musicians and a choir filtered through one microphone and a small amplifier gets a little hard to listen to after a while. So we left Mission San Miguel, stopped by Boo Boo Records, and picked up a version of Handel's Messiah as performed by The Philadelphia Orchestra and The Mormon Tabernacle Choir. I must admit, that Handel was a talented guy! Quick Tip o' the Day: If you're ever on your way to see Handel's Messiah and make a quick stop in a store along the way, and if the clerk asks if you've got any plans for the day, the correct answer is, “We're going to see Handel's Messiah.” If you simply say, “We're going to see the Messiah,” the clerk will probably give you a weird look, stop talking to you, and give the impression that she can't wait for you to get out of the store. If you don't feel like reading the whole article, it's basically about a bunch of scientists who discovered that "donating to charities lit up the brain's reward circuits even more than receiving cash." JoanMarie and I already have a few organizations we give to throughout the year. But because so many great charities are suffering this year, we're looking to donate to a few more...and that's where we'd like your help. In the comments section, tell us about a charity you think should be remembered this season and include its website so everyone else can check it out. We'll pick at least one from your list to further light up the reward circuits in our brains. As well, I'll link to your charities in the sidebar of my blog so anyone stopping by will have the same opportunities to light up their brains, too! On Wednesday, I came across an article in the New York Times which I'm so excited to share with you! Each holiday season, The Morgan Library and Museum in Manhattan displays the original handwritten manuscript of A Christmas Carol (in a sealed glass case, of course) for public viewing. Only one page can be seen each year, but it's fascinating to see the edits Mr. Dickens made on the page. For example, when Scrooge sees Marley's ghost, he tries to dismiss the apparition as brought about by something he ate. At some point during the writing of this classic, Dickens changed a "spot of mustard" to a "blot of mustard", I'm sure because it sounds a tad grosser. You can check out a few high-res pages of the manuscript by clicking here. The Christmas season doesn't begin around here until we take a trip to Holloway's, the neighborhood Christmas tree farm. Even though we weren't ready to bring a tree home yet, my sissy-in-law Louise was visiting so we decided to head on over anyway. JoanMarie still can't walk long distances, but we did take a stroll through the trees. And that's all it took to totally get us in the spirit. ...does it get any better? Of course it does! Just grab a chainsaw while being pulled by a tractor along a bumpy road and let the fun begin. Last year, I don't remember Holloway's having this two-person spinning swing. Of course, JoanMarie will have to wait until next year to ride the swing, but at least we didn't have to play rock-paper-scissors to find out who would take the photos. Did I mention that Louise went to a circus school? Yeah, well, she did. And it's amazing how many times a year those skills can be used. Later this week...the cheesy hometown Christmas parade!